Somewhere deep in the bowels of the pyramids in Egypt, scrawled on the walls of a dark, undiscovered crypt, are the 3000-year old lyrics of a protest song written by a laborer, ranting about poor work conditions and exploitation by the ruling potentates. Fast forward to the 17th century, and “The Digger’s Song” railing about peasants’ land rights in the English Civil War, then “The Little Red Songbook” of the “Wobblies” in the early 20th century (“Songs to fan the flames of discontent”), the musical anthems of the civil rights movement, the anti-war movement, the environmental movement, and the Occupy Wall Street movement. While the news articles, editorial commentaries and books about all of these social/political/cultural upheavals have faded into the mists, we vividly recall the songs associated with those movements, songs that “punctuate” the issue for listeners, and inspire action. “The Art of the Protest Song” celebrates this important and influential role of music in our culture, combining classic anthems/covers with original songs on contemporary topics. During the past two and a half years, there have been a dozen productions of “AOTPS” around the country, and audience response has been overwhelmingly positive. 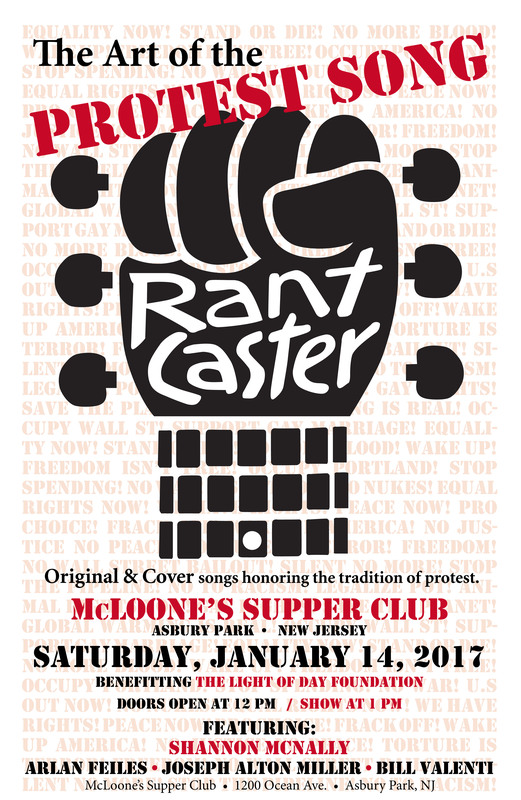 On January 14 “The Art of the Protest Song” will come to Asbury Park for the Light Of Day festival, with a performance at McLoone’s Supper Club at 2PM. Headlining the show will be Shannon McNally, along with Arlan Feiles, Joseph Alton Miller and series originator Bill Valenti. The pen is mightier than the sword, and a song is mightier still!